The self-contained Tour of Vermont and New Hampshire (also NY, MA, NJ, and PA) began on Tuesday, June 17, 2014 at the Wilmington, DE Amtrak station. Some of the 19 participants rented a car, but most boarded the Vermonter for the 11-hour train (and bus, due to track outages) ride to St Albans, Vermont. A rented truck, driven by volunteers Dwight and John, delivered our bikes to the Cadillac Motel where the Tour would officially begin the next morning on June 18. Below is a recap of Days 1-6. Day 1: Saint Albans to Island Pond, VT. Art's puncture right out of the parking lot and Chris' rack and pannier implosion would set the tone for a tour plagued by mechanical problems. In the early afternoon, Ed, Sabine and I left the group and headed from Richford VT to the US-Canadian border hoping for a few photos. Totally unexpected, we were detained by Customs in both countries for almost an hour. 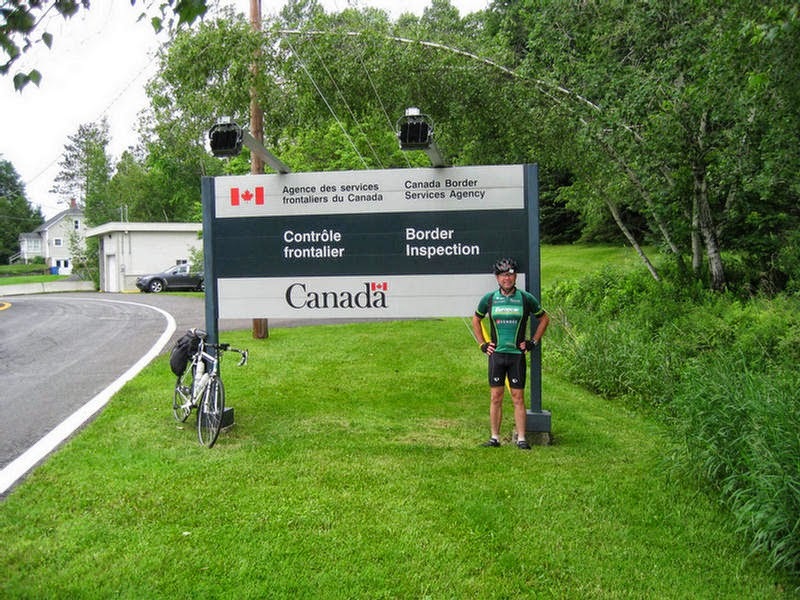 Canada in particular wasn't amused by Ed's attempt to relieve himself in the adjacent woods. From there, the climb of Jay Peak on Route 105 was 7+ miles long and very challenging, riding into a thick fog as we approached the summit. The long, fast, cold, descent was very shaky given horrible pavement conditions. The 3 of us enjoyed lunch in Newport Center before stopping at the Louis Garneau outlet store. The above delays put the 3 of us in drenching rain and even worse road conditions for the last 13 miles to Island Pond. The potholes, frost heaves, and buckling surface meant that even the slightest mistake could cause a major crash. Total for the day was 90 miles. Day 2: To Franconia, NH. A visit to the "Common Sense Cafe" for breakfast ensured a chaotic start to the day. Staff was very friendly, but time had no meaning here. The result was inaction and confusion with our orders. When they did start to arrive, most were incorrect or confused with someone else's. Some of us gladly accepted the wrong order just to eat and get started on today's 68 miles. Later, we enjoyed lunch in Lancaster, NH, at GoGo's. The weather today was perfect, not a cloud in the sky. Among the highlights was some of the Tour's most stunning mountain scenery, and roads that were in somewhat better condition overall. But for some, the damage was done; Mary, who broke a spoke, was fortunate to find a bike shop in Littleton. Day 3: West Ossipee via the Kancamagus Highway. 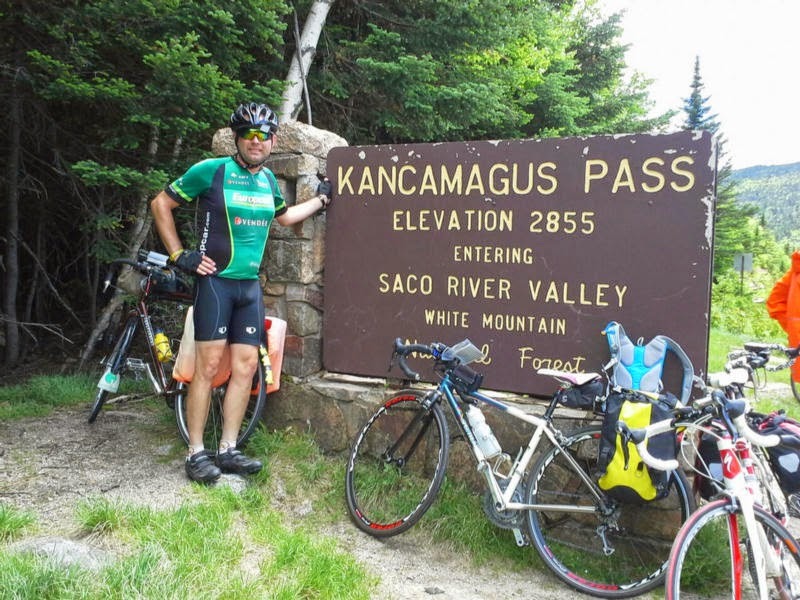 Today brought us spectacular views of the White Mountains along a paved bike path, and a ride over the famous Kancamagus Highway to West Ossipee, NH. Despite perfect weather and fantastic scenery, this was not an easy day. Upon entering Lincoln, I quickly realized we would be swamped with motorcycles for many miles to come. Bike Week NH had all but taken over northern NH. Deafening noise from hundreds of straight-pipe Harley Davidsons passing us in both directions - for at least 30 miles - was nerve rattling and oppressive. Thank god I brought my ear plugs. Again, most roads had potholes, cracks and frost heaves, and it was hard to control the bike at times. Too many of the 67 miles between Franconia and W. Ossipee were (again) spent finding a safe line. It was a relief, however, that most drivers were polite, and - unlike Vermont - gave us plenty of safe space despite the horrible conditions. Among the casualties today was Mary. With the Kanc just ahead, her rear derailleur basically wrapped itself around the cassette, stranding her at the side of the road. In a twist of good fortune, both her and David ended up taking a cab to complete the day's mileage. Day 4: Past Plymouth to Lebanon, NH. A splendid 81 miles today through the lakes region, with numerous steep climbs. Again, it was a beautiful weather day characterized by potholes, tire-eating cracks, and buckling pavement. My new Titanium back seems tolerant, but my Peugeot is taking a pounding and I hope it survives this one last tour. The assault of dangerously loud motorcycles continued at least until Plymouth. They continued to swarm us from both directions and in the towns we passed through. Finally, we reached Lebanon, a wonderful little city with generous bike lanes, sharrows, and BMUFL (bicycles may use full lane) signs throughout the downtown. It was a relief to get to the motel followed by craft beers and dinner at the 7 Barrel Brewery. Day 5: The Assault on Brandon, VT. With 2 major climbs to look forward to, pavement conditions seemed to be improving. However, a demolished river bridge just north of Woodstock forced us to detour through a farmer's field just east of Mt Hunger. It was a harrowing ordeal, barefoot, stepping through boulders, pushing my bike through rushing water only to find out there was no easy way to climb out of the river bed. I finally found what appeared a low bank point but the bike slipped several times and I hurt my back a trying to keep everything upright. Once on the road, I now had a chirping sound coming from my bottom bracket, having been submerged a few times. I enlisted Roger to hold my bike on a shallow angle, as I poured chain oil into the shaft area, but nothing helped. Regardless, we continued on and started the final climb of Brandon Gap. 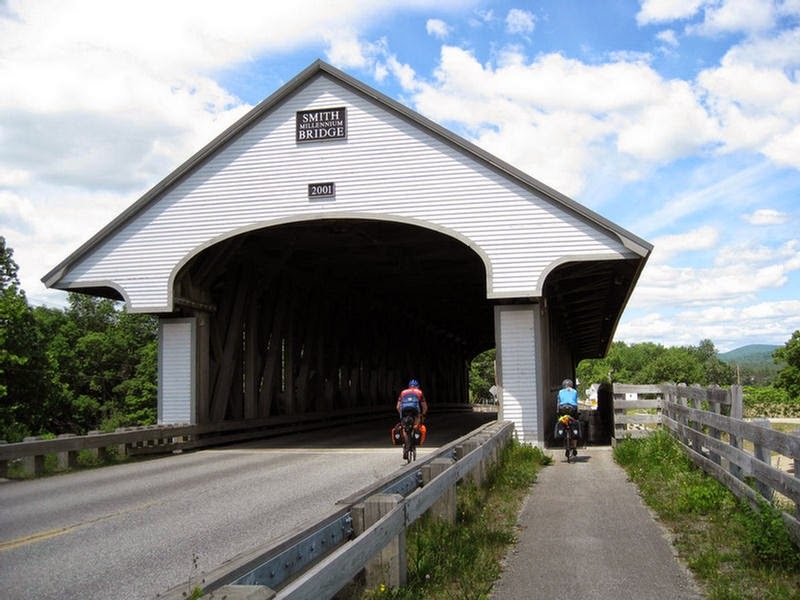 At 2,170', it is one of the toughest passes through the Green Mountains of Vermont. Many in the group stopped at the summit for photos and film clips. The only thing left now was the long fast descent to the Brandon Inn, one of the classiest lodges on the Tour. Again, pavement conditions had everyone on the brakes and being very cautious. Total for the day was 67 miles. 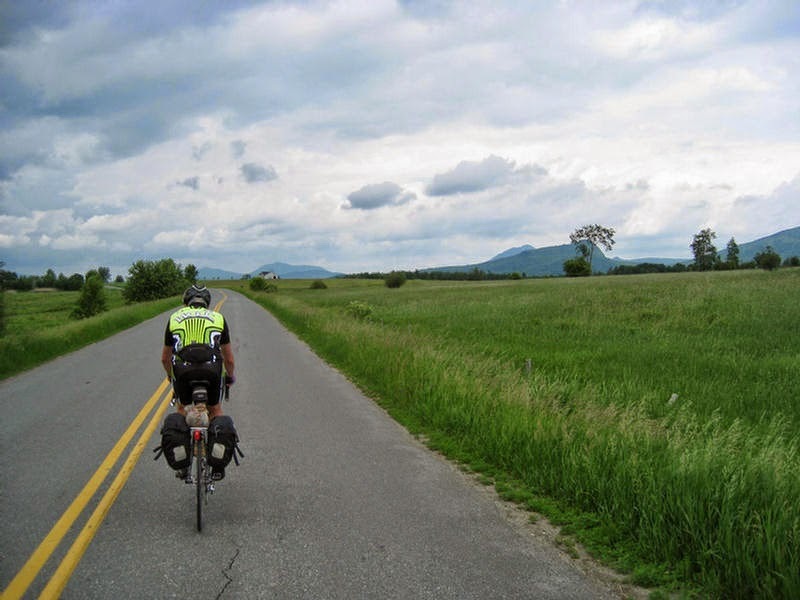 Day 6: Bennington, VT. Increasingly safer roads and shoulders were on the increase. On a personal note, I was definitely paying the price for yesterday's river adventure, with steady dull pain throughout my low back, groin and glutes. The morning's Vicodin and Prednisone cocktail likely saved my day. I expected to feel better the next day, but wouldn't hesitate to dip into the emergency bag again if necessary. This area of VT was a welcome improvement from the North. There is no comparing the Route 30 corridor (that we were on most of the day) with Route 105, which had me cursing the state up and down. Route 30 was mostly well paved, less busy, and included the most stunning scenery in VT so far. It also brought us past Lakes Hortonia, Bomoseen, and St Catherine. I spent many childhood years (mainly early '80s) camping out, boating and fishing with my Dad from Bomoseen SP, so looking out over the lake at Crystal Beach, and crossing Route 4 at Castleton Corners brought back priceless memories. 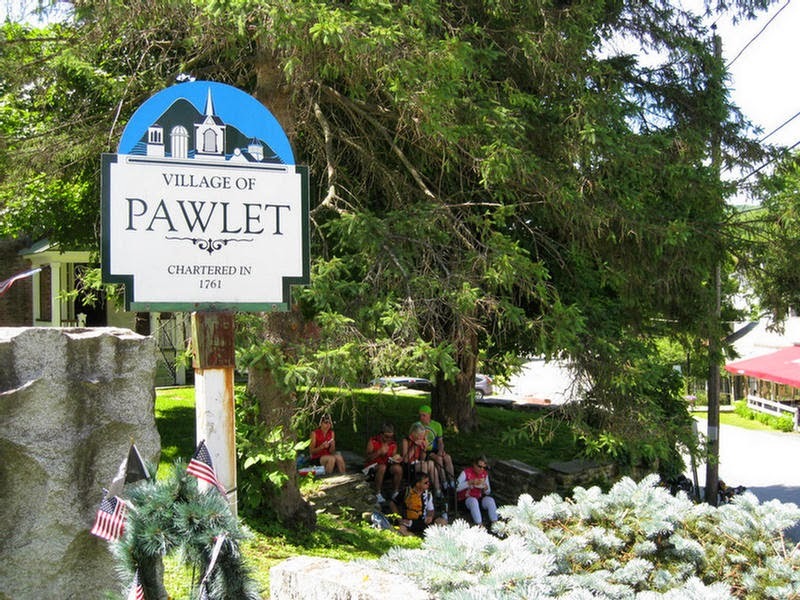 From there, we rode through Poultney before having lunch in Pawlet, then rode through Dorset and Manchester for a view of the Equinox on Route 7A. My bottom bracket was quieter today, and I was less worried now about catastrophic failure. But my chain was stretched considerably, and I hoped to pull back my rear wheel for retentioning this evening. Total for the day was 78 Miles. Check out Part 2, Days 7-12! 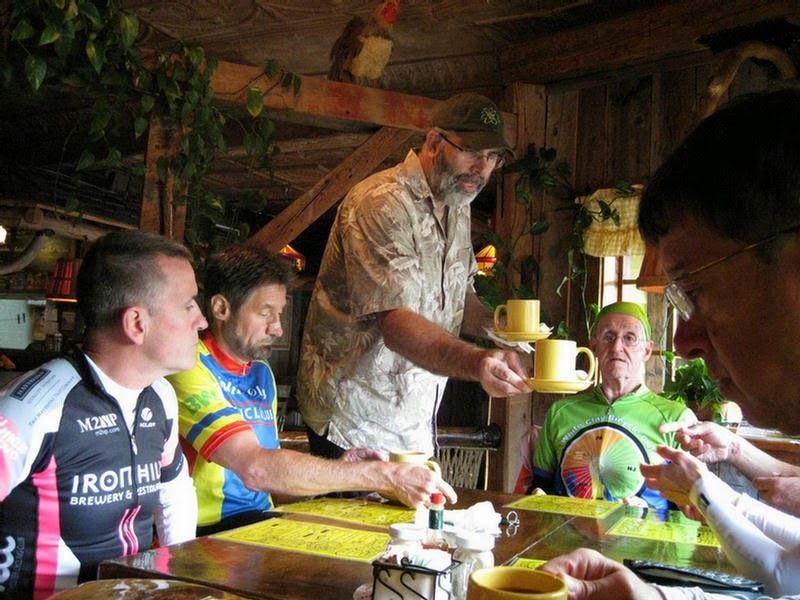 Wally Hertler has organized the most amazing club rides and tours every year since 1976. Mary Clare Matsumoto graciously accepted leadership of this Tour in his absence. For a complete history of the White Clay Bicycle Club, including Wally, click HERE. Related: 2013 Tour of Erie, Revisited.